Though we’ve covered this story over the past two years, here’s a brief review of what happened in the last… 7 years. In 2007 Coventry City FC faced folding, having already sold 50% of their shares in Ricoh Arena and still being in financial trouble. The club was taken over by hedge fund Sisu, who remain in power today. The hedge fund didn’t change CCFC’s fortunes as promised. Instead, the club are still in poor financial condition, were relegated for the first time in many years to League One and left Ricoh Arena for Sixfields in Northampton, roughly 30 miles (50km) away. In 2012 the club seized the contracted rent payments of £100,000 per month, while continuing to hold games at Ricoh Arena. Since then the stadium is effectively left without a major tenant and needed a loan to pay off debts. £14 million were unanimously granted by the city council, which prompted a judicial review by Sisu, who claim the loan was unjustified. The Coventry City Council welcomed this latest decision, while also inviting Sisu back to the stadium. "We are delighted that the judge has found the claimants' grounds for bringing the JR are totally invalid," said Ann Lucas, council leader. 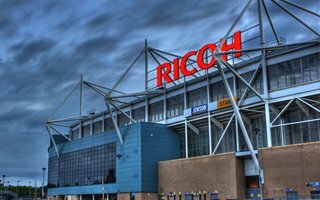 "The decision was taken in order to protect an important asset - the Ricoh Arena - which belongs to the people of Coventry. […] Our door remains open – to the football club, to anyone who wants to talk to us about the future of the Ricoh Arena. Sisu isn’t equally happy with the judicial review and already announced plans to appeal the ruling. Should the appeal be accepted, the dispute is likely to take further months, showing little hope for a permanent solution.